Wes sent me the quote because his sense (like mine) is that “a piece of cake” is as American as red velvet cake. So what was with Manry’s attribution to the English? Thus at the time Manry was writing, it was still predominantly a British phrase, but that would soon change. There’s a bit of noise in the graph — that is, it tracks not only the figure of speech but literal uses, like “What they served me was a piece of cake.” The Oxford English Dictionary’s first citation for the phrase is from a 1936 poem by the American Ogden Nash: “Her picture’s in the papers now,/And life’s a piece of cake.” But I feel that’s an outlier — merely a fresh metaphor concocted by Nash. I wasn’t able to turn up any additional uses until 1942, and all of the ones from then through the early 50s are English. And specifically English military, and even more specifically, RAF. The first quote in the Google Books database comes from a 1942 Life magazine article written by an RAF pilot: “It sounds incredible considering that we were 150 miles from the target but the fires were so great that it was a piece of cake to find the target area.” The phrase, so redolent of the plucky fliers, really caught on. The same year, Terrence Rattigan’s play Flare Path has the line, “Special. Very hush-hush. Not exactly a piece of cake, I believe.” By 1943, it had become so well-known that Cyril Henry Ward-Jackson titled his book It’s a Piece of Cake: or R.A.F. Slang Made Easy. As the Google chart indicates, American use started to pick up but often (as with Manry) with attribution to the English. A 1951 article in an American flying magazine had the line, “The radio operator’s weather reports show all stations ahead in good shape and as the English say, ‘It’s a piece of cake.’” Eventually, we took it to heart, and rightly so, since it’s a great phrase, nicely complementing easy as pie (which refers to a process, rather than a task) while still staying in the realm of baked goods. As with a number of other phrases I’ve covered — including bonkers, nonstarter, and ta-ta (meaning “goodbye”) — Americans have ended up using it far more than the Brits. Stop! Do not write that comment! Or at least hold off until you read the whole post. It shows British prevalence through about 1976, then equivalence until 1987, American dominance for the next fifteen years, and then (surprisingly) a resurgence in Britain. Now go ahead and comment. But now I was seeing evidence that in England, quality is an adjective of perfectly good standing. It was meaningful that the sign was at a pub, for everything about this institution is supposed to signify history and tradition. In other words, the implication was that the usage had been OK for a long time. And when I got home and checked my Oxford English Dictionary, I found that that is the case. The process started as early as Shakespeare, with the noun being used to mean high quality (“The Grecian youths are full of quality, And swelling ore with arts and exercise”) or, similarly, high birth or rank (“There are no men of quality but the Duke of Monmouth; all the rest are gentlemen,” 1671). The adjective emerged roughly in 1700, meaning, in the OED‘s words: “With sense ‘of high social standing, of good breeding, noble’, as quality acquaintance, quality air, quality blood, quality end, quality friend, quality gentleman, quality horse, quality lady, quality living, quality pride, quality white, etc.” There are many citations in the 18th century (“The influence of Peregrine’s new quality-friends”—Smollett, Peregrine Pickle), but starting in the early 19th, according to the dictionary, this usage became “archaic.” The archaicness seems to have commenced being reversed in the United States; the OED cites a 1910 headline in an Ohio newspaper, “American is the quality magazine.” In Britain it became common in the 1960s to refer to The Times, The Guardian, and such as “quality newspapers,” as opposed to the red-top tabloids—so much so that a quality can be used as a noun (once again) to refer to such a publication. One can name a couple of factors, besides British newspaper terminology, that surely contributed to the recent escalation. Business jargon certainly took to the adjective, with its quality assurance, quality management, and quality circles. It’s big in sports, too. One cannot follow a season in basketball or football without hearing incessant talk of “quality wins” or “quality opponents.” A popular statistic in baseball since the 1980s has been the “quality start,” referring to an outing in which a pitcher stays in the game for at least six innings, and gives up no more than three runs. But the big kahuna is “quality time,” about which the OED says, “orig. U.S.: time spent in a worthwhile or dedicated manner; esp. time in which one’s child, partner, etc., receives one’s undivided attention.” The first citation is in 1972, but because it so directly addressed busy people’s anxiety about not spending enough time with their kids or spouses, it quickly became a buzzword, and by the mid-1980s, Frank Rich of The New York Times was deriding it as a cliché. Ngram Viewer shows that it’s more popular than ever. But I would bet that many if not most of the uses are ironic or derisive, suggesting that, like the perpetual-motion machine, the notion that quality time can compensate for sparse quantity time is but a dream. A similar sounding word, also with nursery origins, but apparently with no connection to ta-ta, is ta, meaning “thank you.” I believe this is still current in the U.K. (in fact, it just showed up in an English friend’s Facebook feed), but hasn’t made any inroads in the U.S. I had a brief moment of hope when a Google search found it in a line of dialogue in a 2003 William Gibson novel, All Tomorrow’s Parties: “’Cheers,’ Tessa said, ‘ta for the lager. '” But when I looked into it, it turned out that Tessa is Australian, a fact Gibson tried to emphasize by having her use three separate British-Australianisms in one sentence. I wasn’t familiar with small beer, but it had the ring of a NOOB, so I investigated. The first OED definition is “Beer of a weak, poor, or inferior quality” (what Americans might call near beer). The second, by extension, relates to Carr’s meaning: “Trivial occupations, affairs, etc. ; matters or persons of little or no consequence or importance; trifles.” Or, what Americans would typically term small potatoes. Adams, of course, was an American, and therefore small beer isn’t a NOOB along the lines of gobsmacked or toff. But I do classify it as a “Historical NOOB.” Back in 1777, there wasn’t any, or much, difference between the way Englishmen and Americas used the language. Over the years, however, this particular expression, like many others, acquired a British patina; all post-1777 OED citations are British. 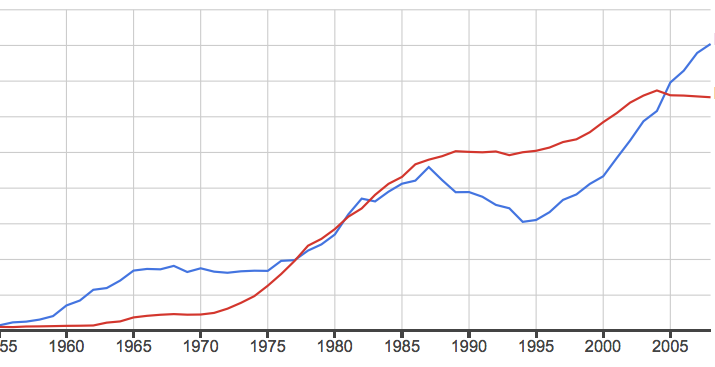 The Google Ngram chart below shows use of the phrase in Britain (red line) and the U.S. (blue line) between 1900 (by which time it was mostly used metaphorically) and 2008. Up until the mid-2000s, it was used between two and three times more frequently in Britain. We’ve talked a good deal about soccer of late. Now for some ruggers. Scrum refers to the deal in rugby where all or most of the players join in a kind of aggressive group hug. 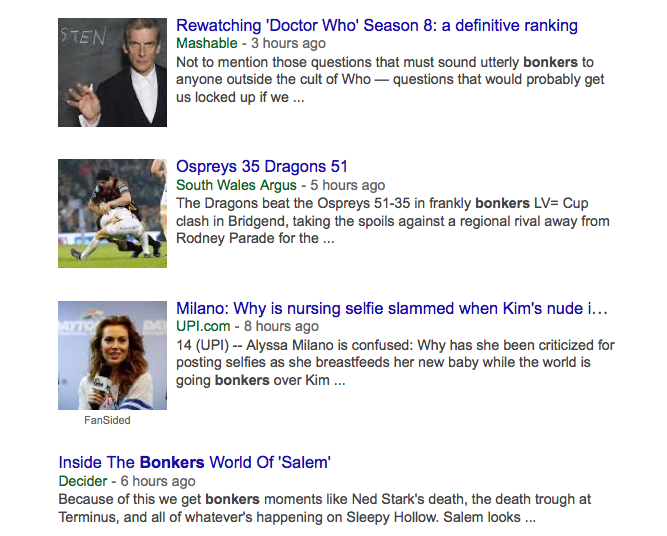 (I await scornful corrections and clarifications.) The OED’s first citation for a metaphorical use–denoting “a confused, noisy throng (at a social function or the like)”–is Murder Included, by J. Cannan (1950): “I kept wondering where you were..in that awful scrum.” That and all subsequent cites in the dictionary are British except for a 1979 quote from the Globe & Mail of Toronto. But Johnny Apple’s erstwhile employer, the Times, has given the word more love, by far, than any other publication. Wes noted a front-page story in the paper yesterday about low pay in Apple stores (great article by the way): “If a solution took longer to find, which it frequently did, a pileup ensued and a scrum of customers would hover.” But that’s one example out of thousands. The Times has used scrum an astonishing 98 times in 2012, all but a handful of them in a non-rugby context. Time to give it a rest, methinks. I’m filing this one under the new category “Historical NOOBs.” When a reader suggested it a few months back, I was initially dismissive, so established an expression (meaning a project, idea or proposal that absolutely will not fly) has nonstarter become. But she (I think it was a she) was right. The OED dates the word back to 1865, when it was used, straightforwardly, to indicate a horse that was unable to start a race. The first metaphorical use was a line from a 1934 P.G. Wodehouse novel, and the first in what I consider the modern meaning from a 1942 book: “That is one reason why non-intervention is such a non-starter.” That and all subsequent citations in the OED are British. 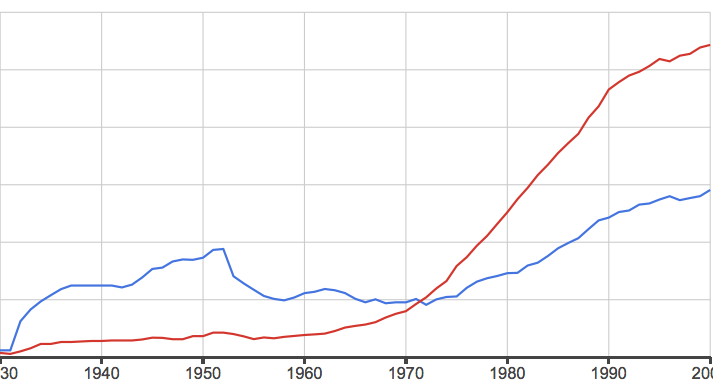 Below are Google Ngram charts showing frequency of use of nonstarter between 1950 and 2008. It’s a bit hard to make out the numbers but they show British use picked up in the ’50s and U.S. use in the ’70s; that Americans caught up with Brits more or less in the late ’80s; and that we now use “nonstarter” more than 50 percent more frequently.